Common signs include reduced engine performance, black smoke coming from the exhaust, backfiring, overheating, or hard starting. Before the advancement of computer controlled engine management systems, which came about in the late 70s, fuel and air was delivered into the engine mechanically through a component known as the carburetor. Carburetors are mechanical devices that blend fuel and air into a suitable mixture that can be ingested for internal combustion by an engine. While modern vehicles are no longer equipped with carburetors, they are still commonly found on many older road going cars and trucks, as well as classic and show vehicles. Since it is the component directly responsible for providing the fuel and air needed for the engine to run, the carburetor is one of the most important components on any vehicle equipped with one, and any problems with it can greatly affect the drivability and performance of the vehicle. Usually a bad or failing carburetor will produce a few symptoms that can alert the driver that attention may be required. One of the first symptoms commonly associated with a bad or failing carburetor is a reduced engine performance. The carburetor is the main component responsible for metering and delivering the air fuel mixture required for the engine to run. So if it develops any sort of issue, it can throw off this mixture and affect engine performance. 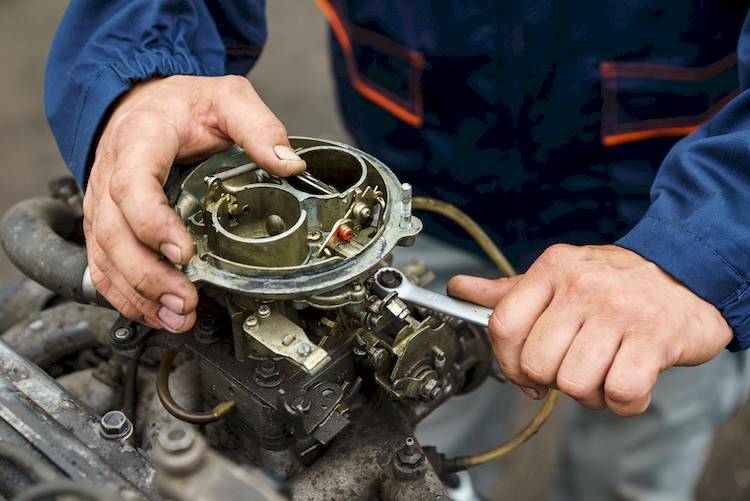 A bad carburetor may result in an engine with sluggish acceleration, and a noticeable reduction in power and fuel efficiency. Another symptom commonly associated with a problematic carburetor is black smoke coming from the exhaust. Black smoke coming from the exhaust is an indicator that the engine is running excessively rich, or using too much fuel. A carburetor that is delivering excessive fuel to the point of producing black smoke, is not only burning unnecessary fuel, but also producing unnecessarily excessive emissions. Engine backfiring and overheating are other common symptoms of a potential problem with the carburetor. If the carburetor has any sort of issue that results in it delivering a lean mixture, a mixture that does not have enough fuel, it may result in engine backfiring or overheating. Aside from causing backfire and overheating, lean mixtures are also bad for engine performance and in more serious cases can also result in damage to the engine. Hard starting is another symptom commonly associated with a bad or failing carburetor. The air fuel ratio that the carburetor is responsible for blending and metering is especially important and sensitive during cold starts. If the carburetor has any sort of issue that disturbs the air fuel ratio it may result in hard starting. Depending on the exact nature of the issue, the vehicle may be hard to start, and get better as the engine warms up, or it may also be difficult to start even when warmed up. While they are no longer standard, carburetors are still found on many road going cars and trucks, and are very important to the drivability and performance of the vehicles equipped with them. If your vehicle is displaying any of the symptoms above or you suspect that your carburetor may be having a problem, have the vehicle diagnosed by a professional technician, such as one from YourMechanic, to determine if your car needs a carburetor service or replacement. Q: My car is over heating and the coolant is running out fast. Q: Carburetor backfiring and won't hold cold start.